Bravura Gold Resort brings to you special offers on Dine & Dance. 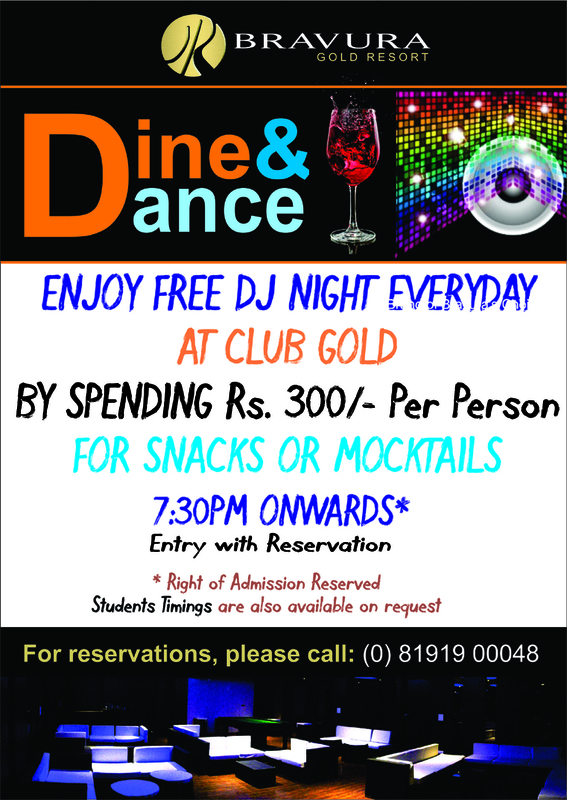 Enjoy Free DJ Night Everyday 7:30 PM onwards at Club Gold by spending Just Rs. 300/- Per Person on Snacks or Mocktails. Students Timing are also available on request. To know more details about Dine & Dance Special Offer at Bravura Gold Resort, kindly send us your request using our Enquiry Form and we will contact you at your convenience. Alternatively, you can also email us directly at reservations@bravuraresort.com or call us at +91-121-7196655, +91-8191079998, 8191900048.